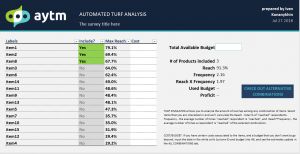 Learn how to use AYTM’s Advanced MaxDiff to conduct a TURF analysis and how to use AYTM’s TURF simulator to optimize your product or service offerings. “TURF” stands for Total Unduplicated Reach and Frequency. It’s a statistical analysis methodology used by researchers and businesses to estimate market and/or media potential. When optimizing product lines, TURF is applied to research the frequency with which consumers are using a product. For media purposes, TURF analysis can measure the number of consumers reached by communication such as an ad, and how often those consumers are reached. In essence, TURF analysis is used to learn which fluctuating factors motivate consumers to purchase particular products. For example, you are launching a new yogurt product and have 20 possible flavors options, but only want to launch with 10. Using TURF analysis can help you determine which products and/or services should be offered, and which they should avoid or discontinue. By receiving these insights, businesses are able to choose the best configuration of their products and services possible in order to reach the maximum amount of people in their target audience. While TURF provides significant value to businesses looking to optimize their product offerings, it’s important to take note of a few things to keep in mind while interpreting results from a TURF analysis. TURF analysis assumes that once consumers are satisfied with a product, they will no longer consider other products in the same category. This is less of an issue for product categories such as home appliances like a television. TURF analysis also does not take the frequency or amount of use of a product into consideration. TURF doesn’t distinguish between the consumer who will likely buy the product twice a week and the consumer who will likely purchase the product once a week. Including questions in your survey to measure the respondent’s frequency of use of your product will allow you to alleviate some of the assumptions that TURF includes. Even though some assumptions are made during TURF analysis, it’s still a powerful tool for researchers and businesses to analyze existing product lines, as well as potential products that are under development. If you are new to the AYTM TURF simulator we recommend starting the exploratory analysis with the Preference Share Threshold 60% method. At the MaxDiff question in your stats page click on the dropdown arrow at the top right of the graphic. When you export the TURF simulator, you can see all possible configurations of the max number of simulations, the unduplicated frequency (how many of your target the combination would reach), and the reach of your target (what percent of your audience the combination would please). For each respondent, the system marks items that were perceived as relatively likable as being “reached”. Since items that were not liked nor disliked would have the preference share around 50%, setting the threshold to 60% would exclude those items that seemed neutral, while also allowing for situations when several items were deemed moderately but not extremely likable. In the summary view, you can activate or disable certain items to see how it affects the summary statistics. Additionally, you can enter the total budget and item cost to see additional data on how well certain selection fits the budget. The ‘All combinations’ view lists all possible combinations of activated items and allows in-depth filtering. For instance, you may be interested in the best combination of 3 items, excluding one particular item. With Excel filters built into the simulator, this can be achieved in no time. Leveraging the insights gleaned from the TURF simulator will help you streamline development and maximize your profits by finding out what consumers actually prefer. Has your organization leveraged TURF analysis to inform product optimization or market research? If so, we’d love to hear from you! Comment below or email us – support@aytm.com.